So many times you hear the term “clay dots” thrown out to reference the pre-CBS fender fret markers. Simply put, that’s what they look like is clay. And for many years people have thought of them as clay. I’ve heard about many luthiers re-fretting a vintage strat and putting a homemade paste mixture in there to simulate the original dots. Ready for the true story? They are not clay at all. And they weren’t always yellowed or grayish colored either. At one time they were white as seen in the image below of a 1961 Stratocaster in great condition. You can tell from that image that the last couple of dots are showing a little yellowing but the upper neck dots are still pretty white. The reason is that they are actually made from white vulcanized fiberboard. The image below is from around 1959 and shows a worker in the Fender factory with a huge Folder’s coffee can full of those white fiberboard cutouts putting them into slab board necks. The above image shows what looks to be Jazzmaster necks by the shape of the headstock. Also, the wide spacing at the 12th fret seems to indicate a time period of after mid-1959 (rosewood fretboard) and before July 1962 (slab rosewood fretboard). 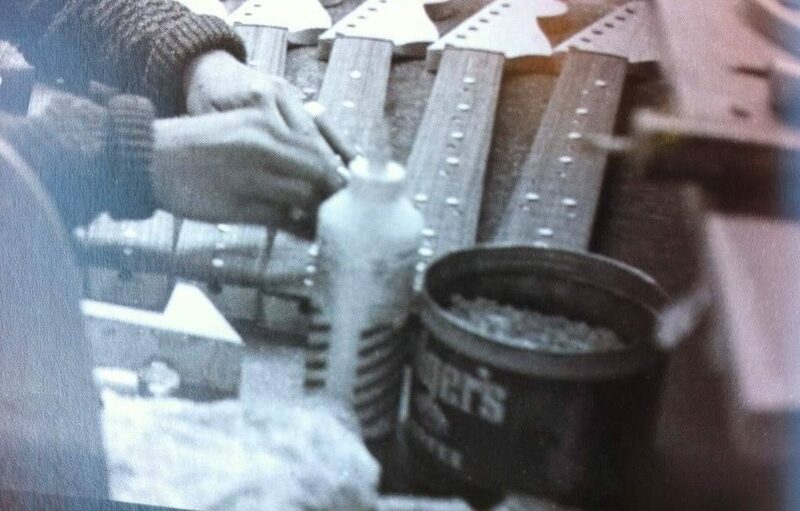 Former musician and Fender plant manager Bill Carson once stated in an interview that the white dots in rosewood ´boards from 1959 to 1964 were installed the same way as the black dots prior to 1959 and that the material was fiberboard. Here is what the dots normally look like after years of use. You can see how they really turn a yellow or even a rustic brown type of color. They become very yellowed and usually dirty from years of finger oils. The yellowing normally comes into play because of the cellulose in the material they used for the dots. They used a lot of cellulose back then. (The same material film used to be made from) The pickguards are made of celluloid nitrate. It’s a very flammable material which is why it was discontinued in the mid-60s by Fender. They went to a PVC based plastic called ABS that didn’t shrink and yellow like the cellulose and it wasn’t flammable like it either. The “clay dots” were used for the most part from mid-1959 – late 1964. Although I’ve seen a few on very early 1965 Stratocasters. The pristine example listed below is a perfect example of that. She is a Jan 1965 and is a real beauty. As you can see the above guitar has it’s original frets so the dots are the originals. You can also see that the guitar has the newer 1965 white pickguard instead of the previous “mint green” version. Since those dots are made of a vulcanized fiberboard containing cellulose they tend to shrink like the pickguards of that era do. It’s not uncommon to see fret marker dots look like they are shriveling up into the hole cut for them. They are also fairly thin. So, if you sand the fretboard (Which I highly DO NOT recommend doing for any reason) when refretting the guitar you can actually sand through them. Got them fixed. Sorry about that. It would be great if the pictures show correctly! 1961 Fender Stratocaster Real Or Fake? © 2017 Pre CBS Stratocasters. All Rights Reserved.